Isuzu Motors Limited announced that it has given its Giga heavy duty truck range a full model change, and launched them in Japan yesterday. According to Isuzu, the new Giga has evolved from a stand-alone truck into a “connected carrier system” to maximise customers’ uptime by giving solutions to the issues they are facing such as labor shortage, operational cost, environmental and safety problems. Its performance, sophisticated from the five viewpoints of drivers’ comfort, fuel efficiency, total safety, loading capacity and remote assistance, will surely better serve the needs of customers as an ideal next-generation truck. A semi-round instrument panel has been adopted. All the switches, grouped by frequency of use, are located near the meters. Steering wheel switches and 4-inch multi-information LCD monitor. The seats have been improved in adjustability, air permeability and capability to support the occupant’s postures. The 6UZ1 engine has been improved. The following modifications have been made to increase the low to mid-range torque and improve fuel efficiency. The specifications of the turbocharger, changed. The intercooler and radiator, made larger. The highly efficient EGR cooler, adopted. The ultra-high pressure common rail system, adopted. The cargo and dump models come standard with the “ecostop” system which automatically stops and restarts the engine to minimize the unnecessary fuel consumption during idling. The automated manual transmission, Smoother-Gx, has been improved to enable the vehicle to offer a smoother-ever start, by decreasing “shift shocks”. In addition, by adopting the engine retarder, the capabilities of the auxiliary brakes, have been improved. The models equipped with the 6UZ1-TC engine and 12-speed Smoother Gx, come standard with the “Smart Glide” system. This system automatically disengages the clutch when the vehicle is running on a downgrade with its accelerator pedal lightly depressed in order to effectively utilize the inertial force of the vehicle for more fuel saving. The pre-crash braking system has the collision avoidance support function added to cope with moving obstacles, in addition to the conventional collision mitigating function. The double detecting mechanism using a millimeter wave radar and a camera, has largely improved the accuracy of forward obstacle detection. The newly adopted LDWS (Lane Departure Warning System), monitors the lane markers using the camera, and alerts the driver when he/she likely goes out of the lane using the warning buzzer and the 4-inch LCD monitor. In spite of the full-model change, the curb weight increase has been minimized to ensure high loading capacity. The MIMAMORI system, which analyzes the data from vehicles on-line, is being offered as standard equipment. A variety of useful advices for compliance with laws and regulations and eco-driving will be given through this system. What’s more, the real-time status of the vehicle can be easily checked via the internet by the customer too. The high quality genuine maintenance program, “PREISM” is being provided by utilizing the vehicle data collected via the MIMAMORI system in advance. Through this maintenance program, the authorized Isuzu dealers will be pleased to boost customers’ uptime. 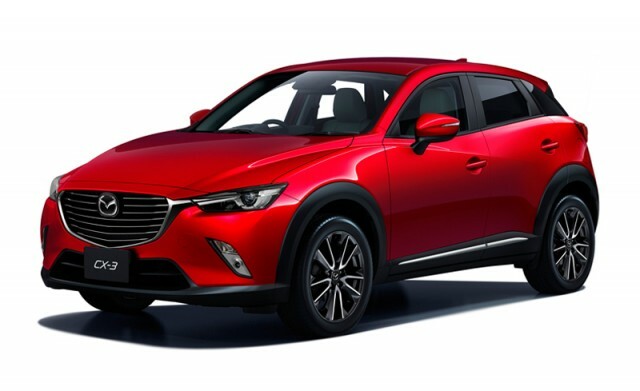 Mazda Motor Corporation announced today that it held a ceremony to celebrate the start of production of the all-new Mazda CX-3 at Auto Alliance (Thailand) Co., Ltd. (AAT), the company’s production facility in Thailand. Approximately 300 people attended the ceremony, including Mazda’s Managing Executive Officers Kiyotaka Shobuda and Kazuhisa Fujikawa as well as executives and employees of AAT. Production of the all-new Mazda CX-3 began at the Hiroshima Plant in Japan in December last year. AAT is the second production location and the first overseas facility to start producing the model. The all-new CX-3 is the fifth model in Mazda’s line-up of new-generation vehicles featuring the full range of SKYACTIV TECHNOLOGY and KODO-Soul of Motion design. As a new kind of compact crossover SUV, it offers all the essentials people look for in a car; a quality, stylish design; packaging developed for ease-of-use; and responsive driving performance. Mazda launched the CX-3 in Japan in February this year as a new core model and has since begun sales in other key markets, including North America, Europe and Australia. Mazda will continue its efforts to enrich people’s lives through a variety of touch points, including the production of high-quality cars, and become a brand with which customers feel a strong emotional connection. DAF has announced that it will be extending its DAF Transport Efficiency programme into the bus and coach sector. According to the company, the programme aims to further increase efficiency for operators, and to achieve this goal, DAF Components will supply a complete range of reliable and economical PACCAR engines, as well as a comprehensive package of services to ensure maximum vehicle availability. 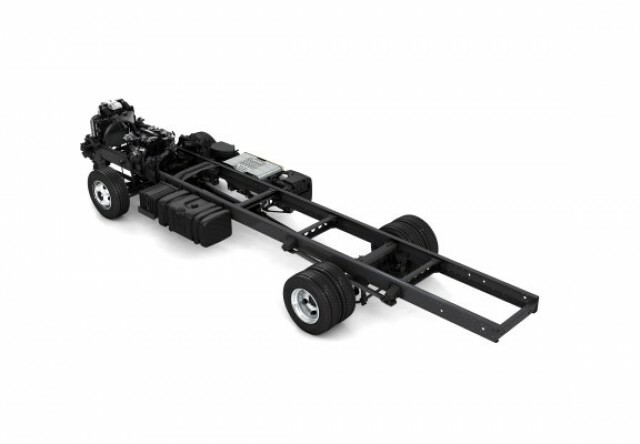 A key new addition to the DAF Components offering is the DAF LF chassis module as a basis for compact buses. 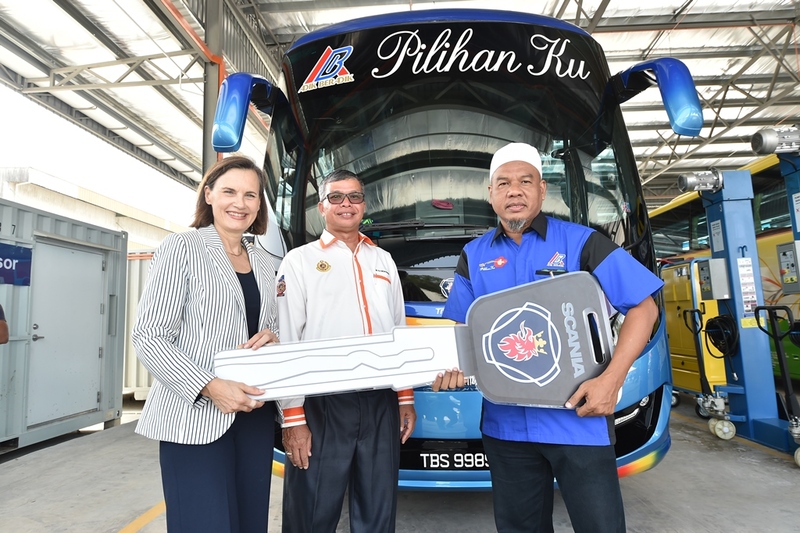 The chassis, which forms an ideal basis for compact buses with 30 to 40 seats, comes with a wheelbase length of 4.30 to 5.40 metres and with 4.5-litre PACCAR PX-5 four-cylinder and 6.7-litre PACCAR PX-7 six-cylinder engines (Euro 6). The company claims that the LF chassis module is perfect for building compact school buses or luxurious VIP buses. Operators of buses or coaches featuring a PACCAR engine can call on the assistance of more than 1,000 DAF service points located across Europe and beyond, of which 200 are specially appointed as ‘DAF Coach & Bus dealers’. Trucks of the future are going to be a whole lot smarter. Tomorrow’s Intelligent Truck from Volvo gives you an idea what’s in store for truck drivers. We are talking about a connected vehicle that can think for itself. It can perform self diagnosis and self-repair minor problems. The truck makes its service appointments automatically. The truck can adjust the performance of its system and components based on weather and road conditions. Each truck is customized to the driver’s individual driving style and the type of task at hand. This video gives you a better idea how future trucks will perform. 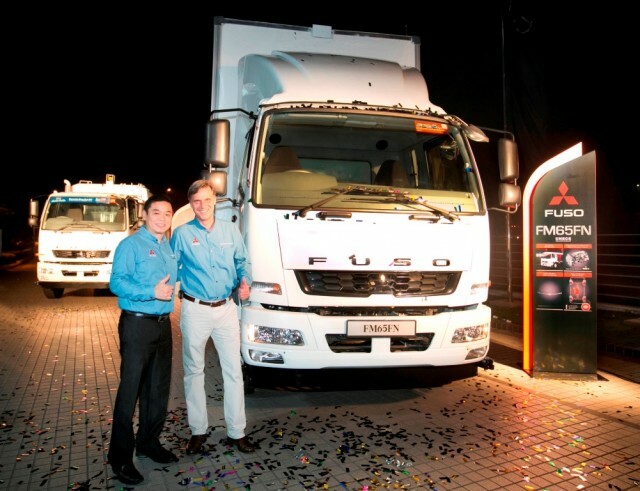 Mercedes-Benz Malaysia, the authorised distributor of Mitsubishi FUSO, has launched three new models, the FM65FN, FM65FJ and the FN62FM, further enhancing the Mitsubishi FUSO product portfolio in Malaysia. Succeeding its predecessors launched between 2009 and 2010, the upgraded variants – FM65FJ, FM65FN and FN62FM – feature a complete new engine and chassis. The FM65FJ is a six inline engine generating a total of 686 Newton metres of torque with a maximum output of 240ps@2600rpm. With its taper leaf spring suspension, this vehicle is ideal for construction and heavy-duty use. The FM65FN, like its counterpart, the FM65FJ, also boasts a powerful six inline engine generating 785 Newton metres of torque, producing a maximum output of 270ps@2600rpm. The 16-tonne truck has a best-in-class, high productivity and cost efficient engine. With its engine specifications and aerodynamic design, the FM65FN offers a smoother ride and is ideal for the logistics sector and transport of heavy weights, in particular long haul drives. FUSO’s medium-duty FN62FM stands out for its nine-speed transmission with a high-low range change. The FN62FM generates a maximum output of 270ps@2600rpm and 795 Newton metres of torque. Equipped with a crawler gear, the FN62FM provides the maximum torque required in all its applications. The FN62FM fares particularly well in quarry areas, with an all-new transmission, the FN62FM offers drivers better efficiency and lower fuel consumption. The FM and FN models are equipped with a common rail injection system and are Euro 2 emission and UNECE regulation compliant. 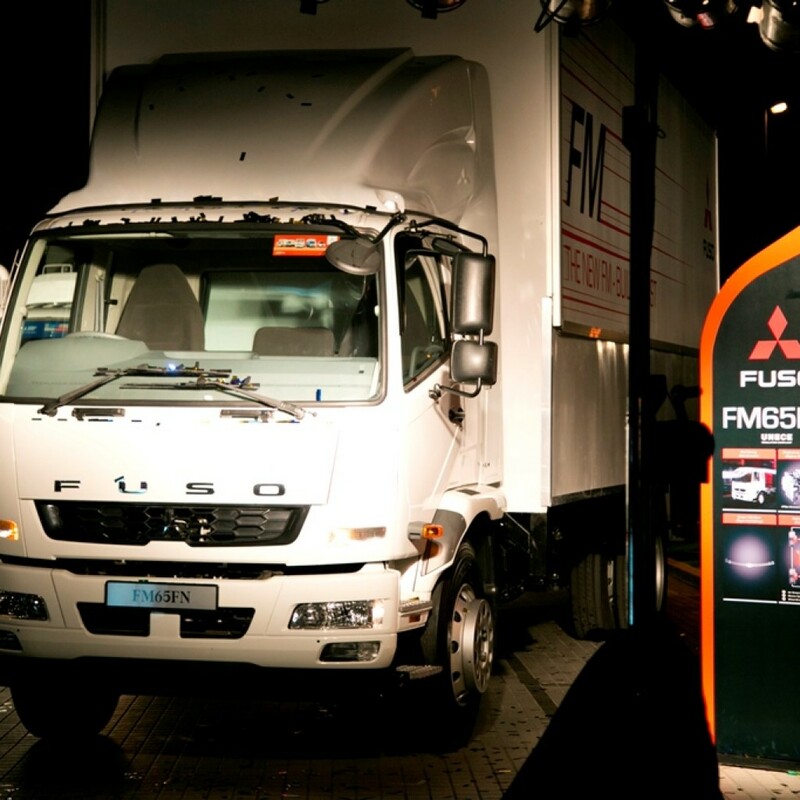 FUSO’s FM and FN series incorporates specific safety aspects. These include the anti-lock braking system (ABS) and exhaust braking which assist drivers to avoid uncontrollable skidding and offers better braking performance. Other additional inclusions are the reserve sensor and daylight running light. Known for providing comfort, ease and peace of mind, FUSO’s cabin design continues to excel in its FM and FN series. With an all new design, the FM and FN cabins now offer drivers and passengers alike, easier access, expanded headroom and an additional footstep for easy in-and out access. The 4×2 FM65FJ, 4×2 FM65FN and 6×4 FN62FM are priced (bare chassis list price with GST) at RM183,688, RM198,288 and RM265,888 respectively. The models are available from October 2015. 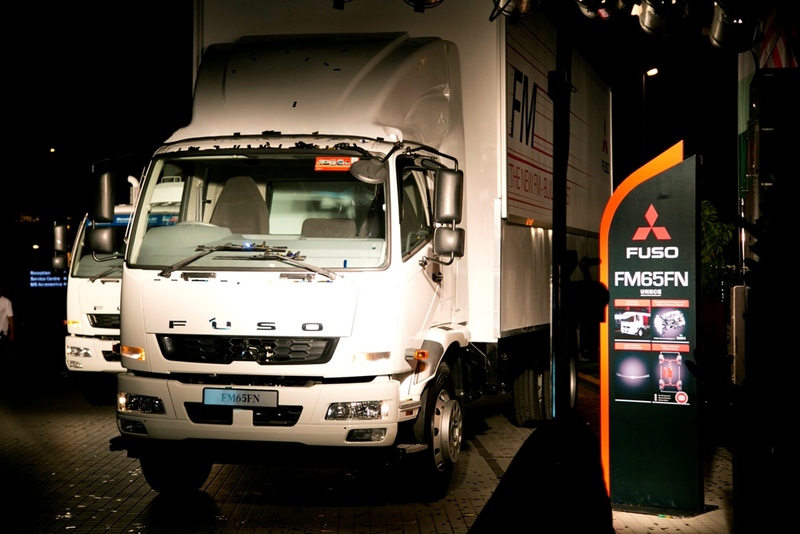 FUSO’s new FM and FN models come with a 100,000km or two-year warranty (whichever comes first). Customers will also enjoy three complimentary services for the trucks up to 20,000 kilometres free service charge, spare parts and lubricant oil. Mitsubishi FUSO has an extensive nationwide network. At present, Mitsubishi FUSO has 37 authorised dealers and 44 service centres that offer easy access to after-sales support. For more information on Mitsubishi FUSO, visit www.my.mitsubishi-fuso.com or 03-2246 8888. Edaran Tan Chong Motor Sdn. Bhd. 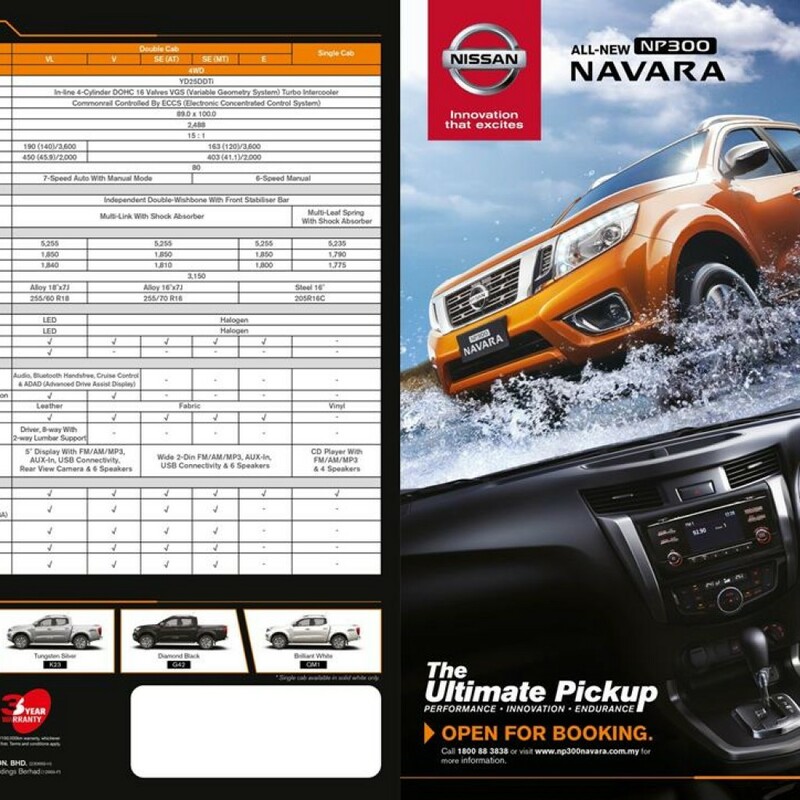 (ETCM) is now accepting bookings for the All-New Nissan NP300 Navara, set to be launched in November 2015. The NP300 Navara comes as the most powerful pickup in its segment with the improved 2.5L, 3rd Generation YD25DDTi engine, which produces a maximum power output of 190 PS and torque of 450Nm/2,000rpm. Paired with a first-in-class seven-speed automatic transmission with manual mode, drivers are ensured more power with smoother acceleration. A host of other impressive specifications include a first-in-class all-new multi-link rear suspension for SUV-like riding comfort, distinctive V-motion strut grille, full LED Headlamp with an impressive boomerang-shaped Daytime Running Light, rear spoiler and new 18-inch alloy wheels. “When we first introduced the D40 Navara with the tagline ‘Mother Trucker’ to the Malaysian market, it redefined the pickup segment with its performance and driveability. Today, the All-New NP300 Navara will once again raise the bar with its dynamic driving performance, robust endurance, innovative design and advanced technologies, hence its tagline of ‘The Ultimate Pickup,’” said Mr Tan Keng Meng, Director of Product Planning and Marketing of ETCM. 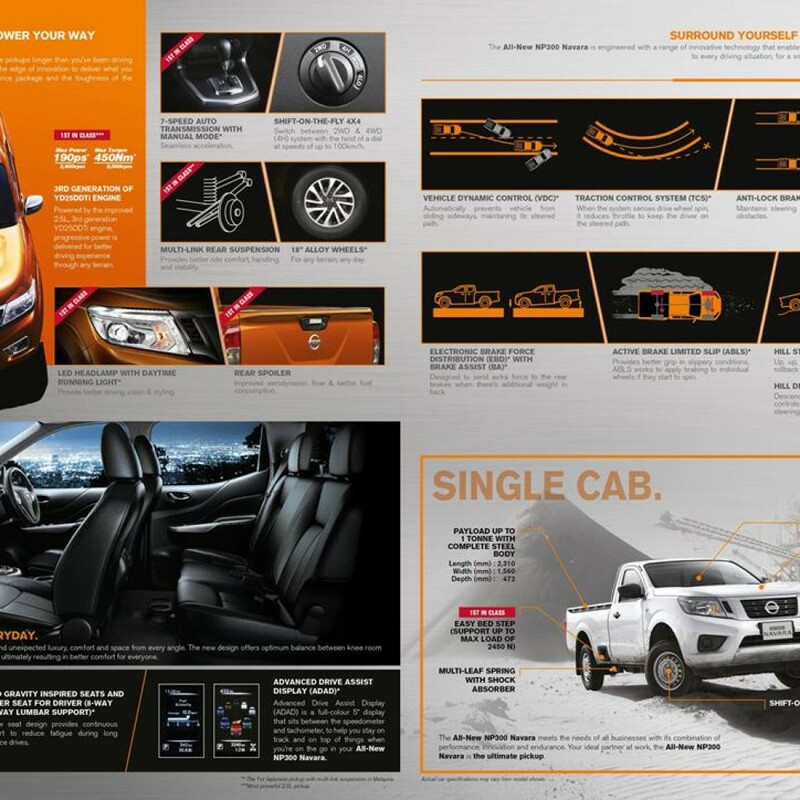 Within its smartly-designed interior, the NP300 Navara comes with the same luxurious comforts found in Nissan’s other premium models – Zero Gravity Inspired Seats helps to reduce driver fatigue; and optimum cabin cooling is ensured in every drive with dual zone automatic air conditioning and Rear Air-Conditioning Vent. 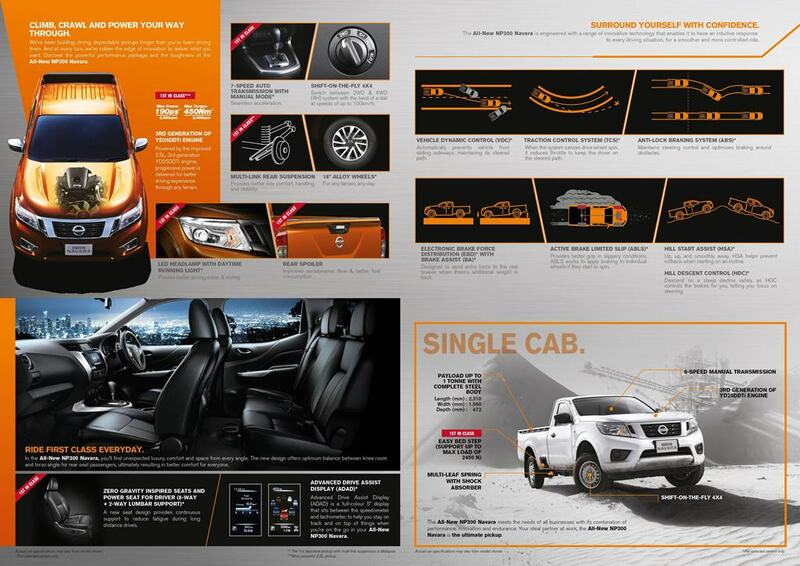 The NP300 Navara offers top safety features for every driving situation. It is equipped with Active Brake Limited Slip to provide better grip on slippery roads and enhance the vehicle’s stability, Hill Start Assist and Hill Descent Control. Other key safety features include child seat retainer (ISOFIX), Vehicle Dynamic Control, Anti-locking Braking System, Electronic Brake Force distribution, Brake Assist, and Traction Control System to help the driver stay in control and avoid danger in emergency situations. The All New NP300 Navara comes in four colours – an all-new Savanna Orange, Tungsten Silver, Diamond Black, and Brilliant White. 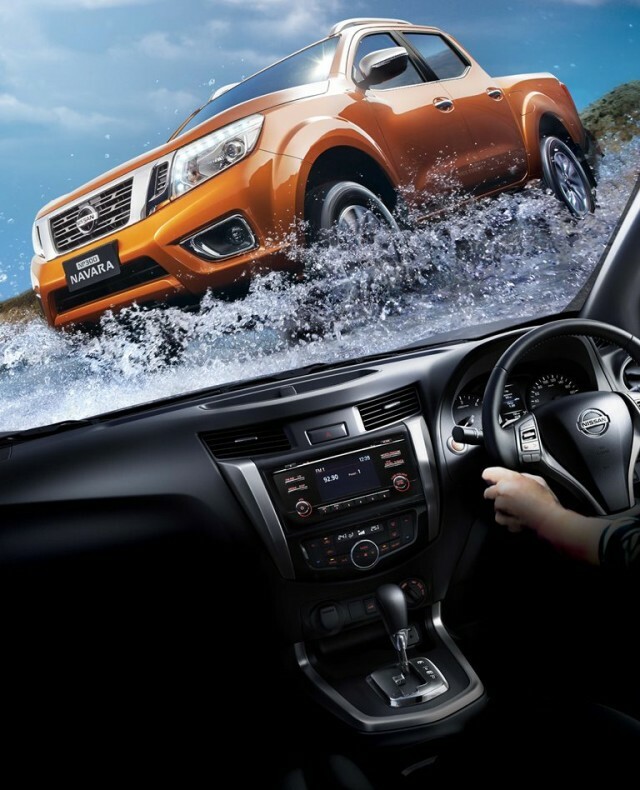 Malaysians eager to get up close to the ultimate pickup are also invited to make their way to Nissan Roadshows happening around the country beginning 15th October 2015. Among the attraction is a unique, one-of-a-kind 3D floor art display starring the NP300 Navara. Members of the public can visit www.np300navara.com.my to discover Nissan’s 80 years of pickup heritage, together with an owner’s testimonial video highlighting the performance of the Navara, and also to register their interest on the NP300 Navara for an invitation to an exclusive test drive. 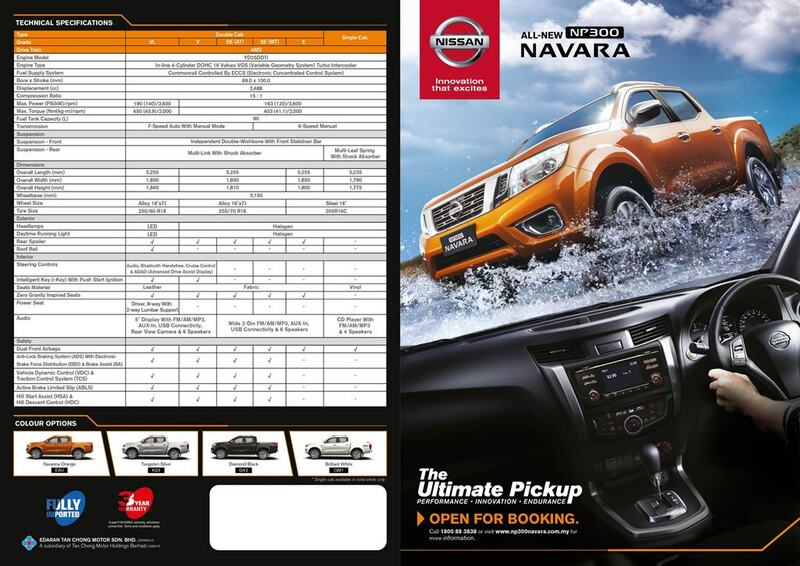 Bookings for the All-New Nissan NP300 Navara can be made at all Nissan Showrooms nationwide. Interested parties can also call the Nissan Customer Care Centre Hotline at 1800 88 3838 for more information. 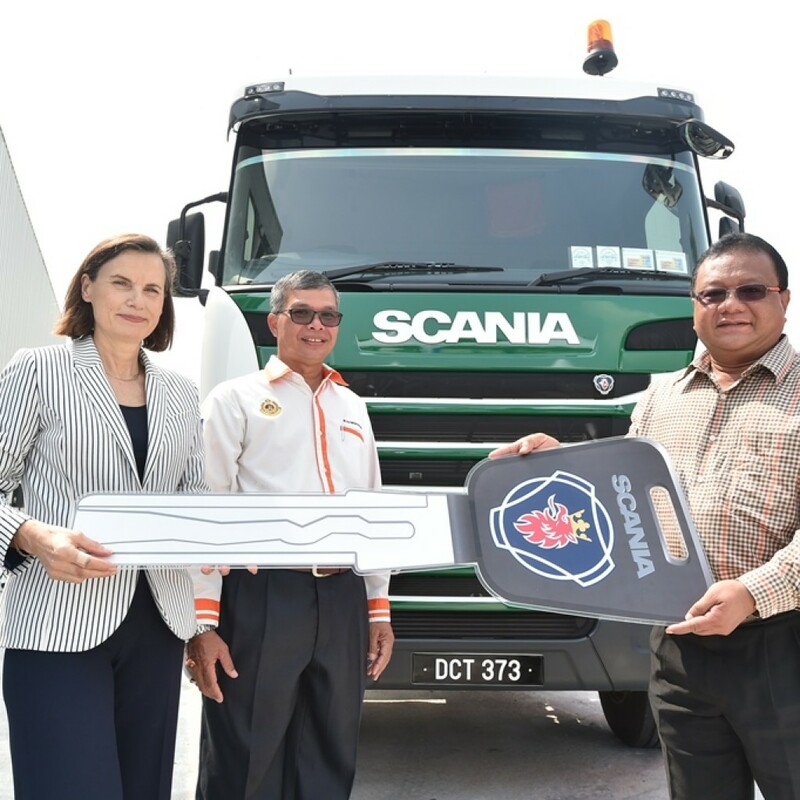 Scania (Malaysia) Sdn. Bhd. 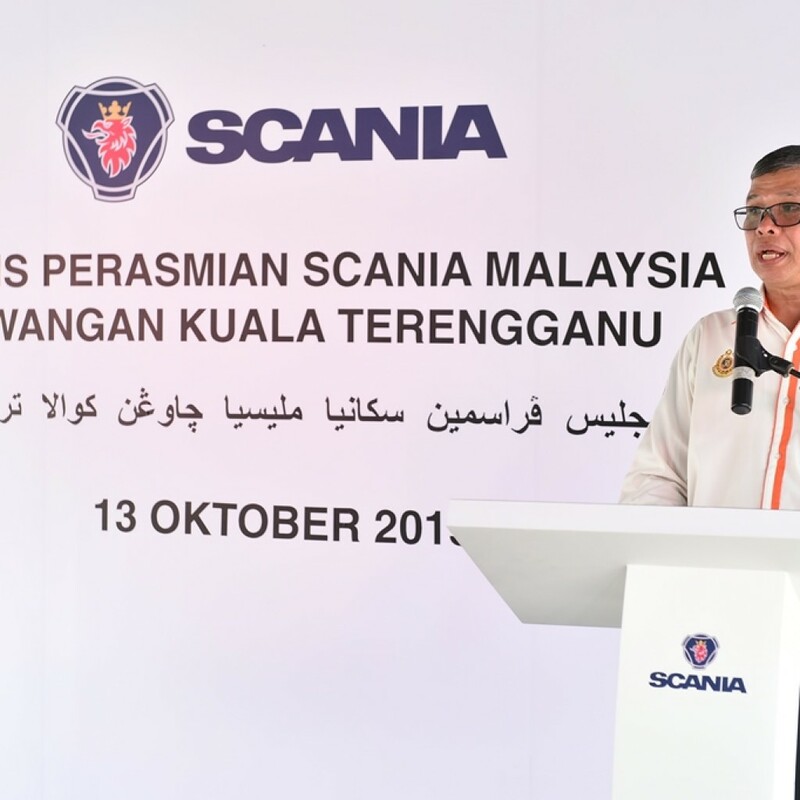 has officially launched its Kuala Terengganu service centre, further strengthening its sales and services for all customers in the East Coast region. 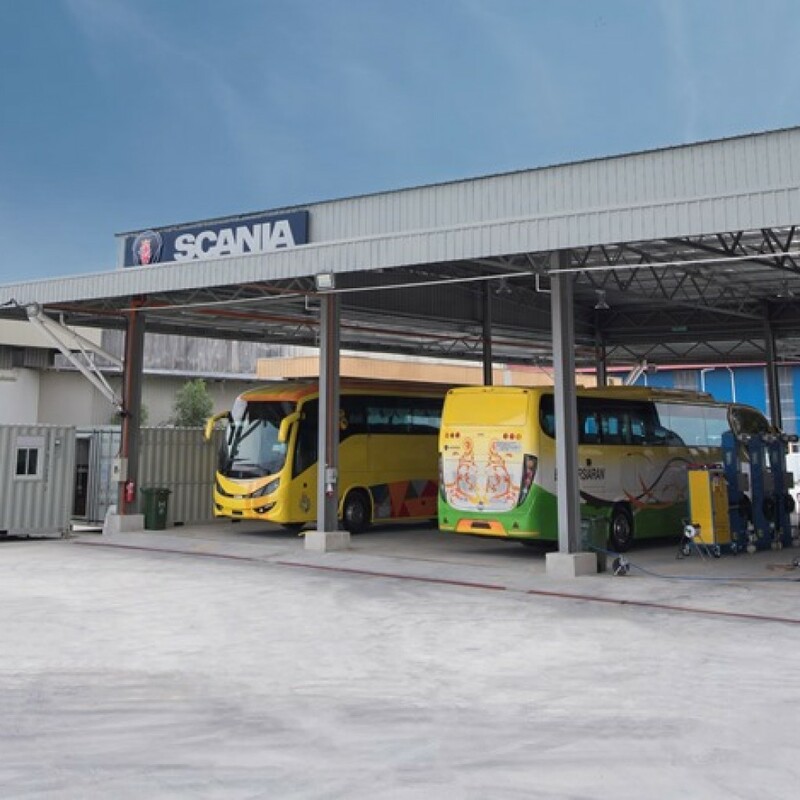 Customers can now send their Scania trucks, buses and coaches, marine, industrial and power generation engines to this service centre for regular maintenance. 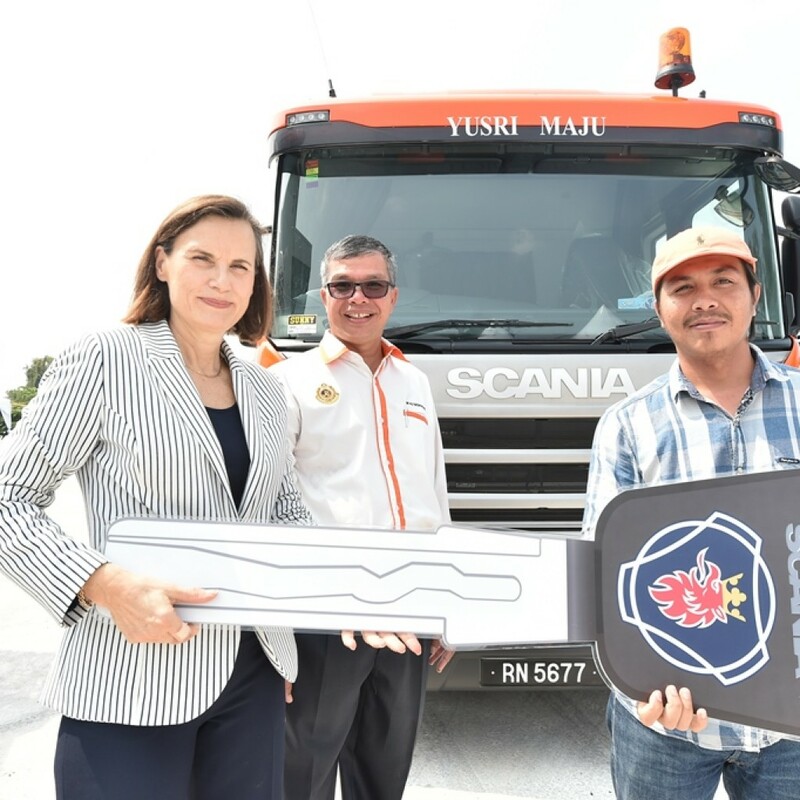 “The opening of Scania Malaysia Kuala Terengganu service centre demonstrates our continuous improvement in providing the best services for all our Scania customers for their best profitability in this state, region and across the country,” said Marie Sjödin Enström, Managing Director of Scania Southeast Asia. A complete service solution, Scania Malaysia Kuala Terengganu is now part of a vast network of 10 Scania service centres in Malaysia. The service centre covers an area of 3,759.18 square metres consisting of three bays and one pit. It will be operated by well-trained Scania technicians, service advisors and parts personnel. 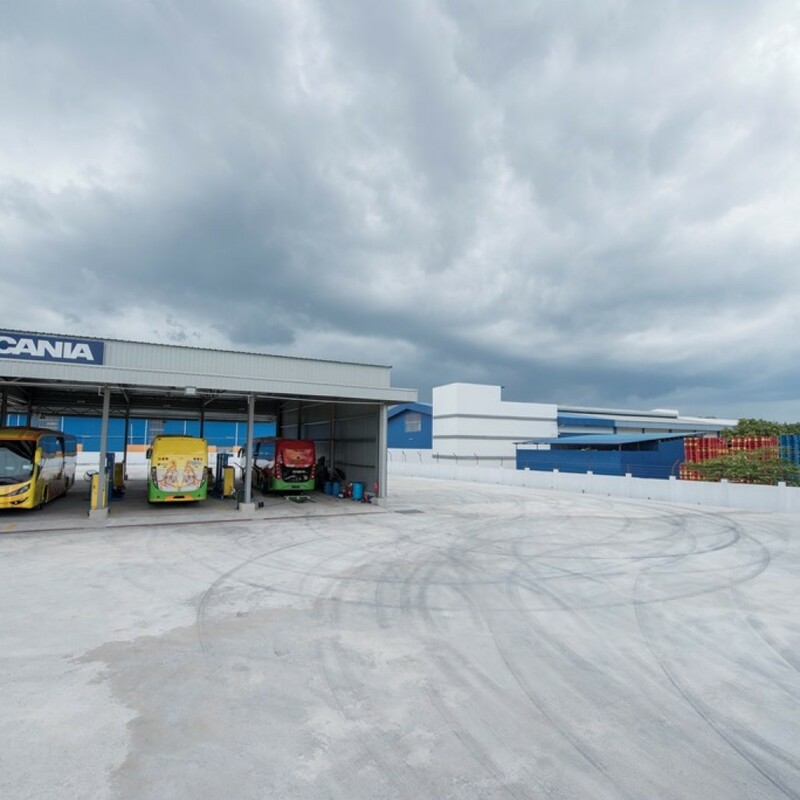 With support from Asian Parts Centre in Singapore, Scania Genuine Parts are available at this new service centre. Scania Assistance is also available 24/7 365 days by calling 1800-08-8500 – the new standby service van adds to a growing fleet of roadside assistance in this state and in the country. The service centre is headed by Wan Noaimadudin bin Wan Mohamad Kamal (Aiman). As the Branch Manager, he has a Degree in Mechanical Engineering (UiTM) & has been with Scania Malaysia and Scania Regional Product Centre for more than five years now. He reports to Chandra Rajan who is the Region Manager for Region East. 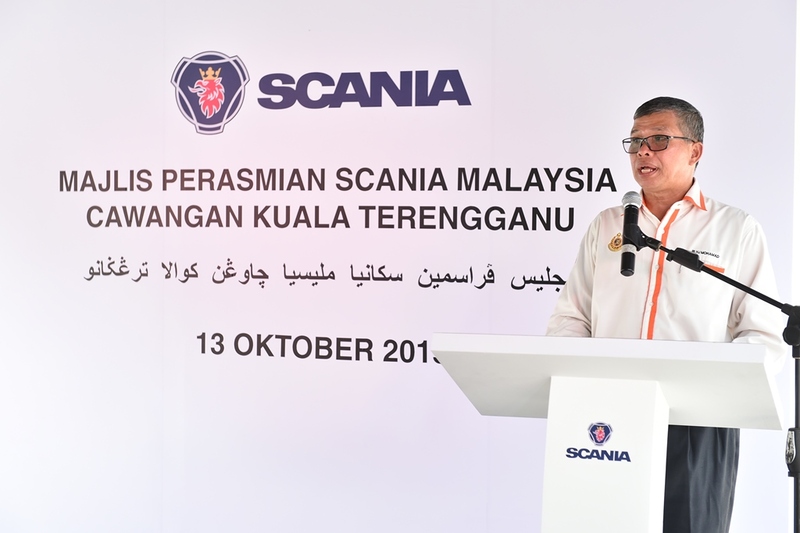 All of Scania customers in Terengganu state will continue to enjoy the wide range of solutions that will help their business achieve the best profitability. 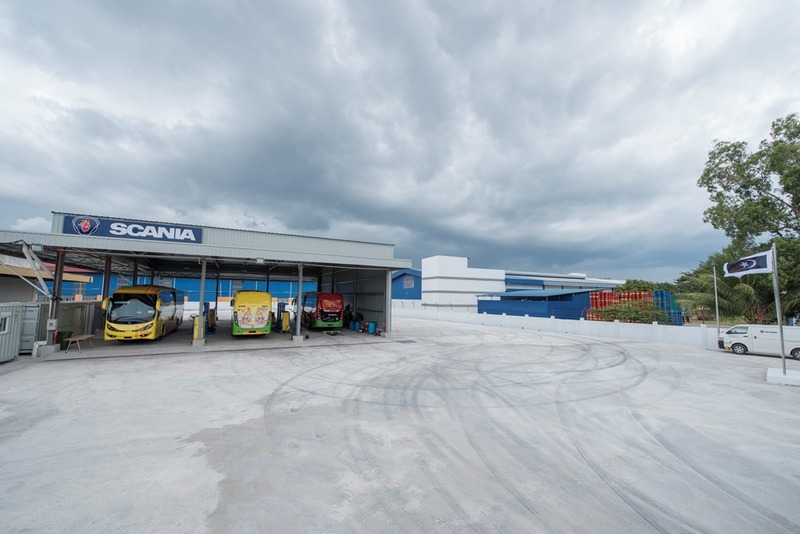 Scania Contracted Services are honoured at all service centres including this one. Scania financial solutions are also available from Scania Credit (Malaysia) Sdn. Bhd. Customers who want to get the best out of their Scania vehicles in terms of the best fuel economy and safety can also subscribe to Scania Connected Services – consisting of Vehicle Introduction, Driver Training, Driver Coaching, Driver Support and Scania Fleet Management. 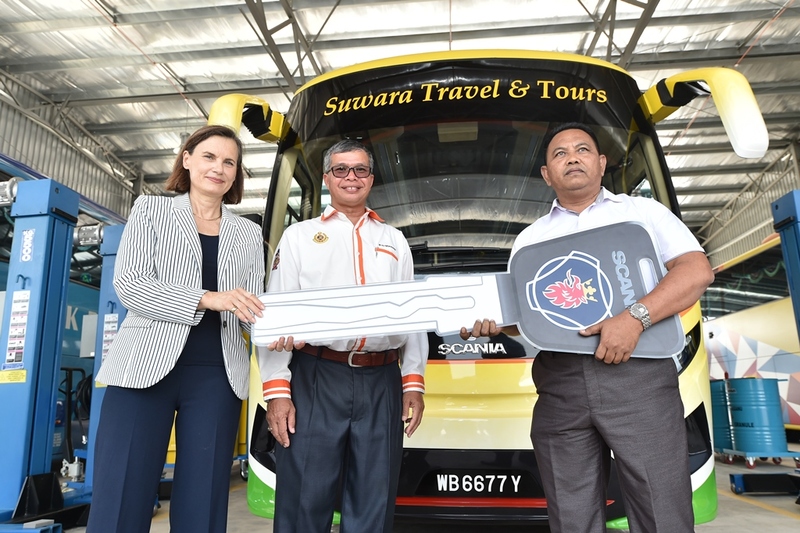 In conjunction with the service centre opening, Scania made an official handover of trucks and coaches to customers. Agensi Pelancungan & Adik-beradik took ownership of two units of K360IB4x2 bus and Suwara Travel & Tours Sdn. Bhd. took one unit of the same model, while Syarikat Pengangkutan Bumi Pantai Timur Sdn. Bhd. 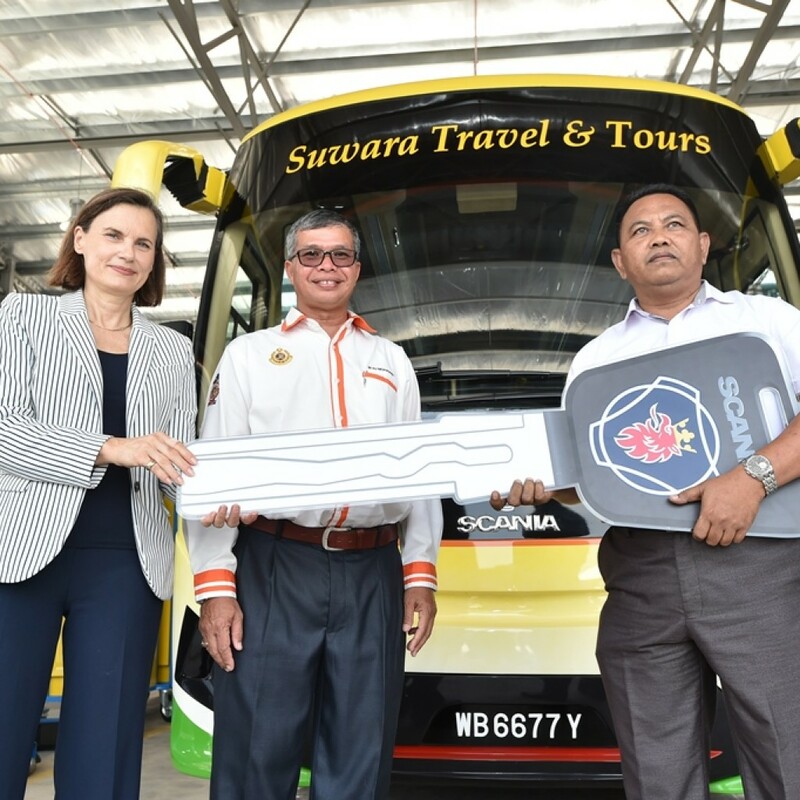 took the keys to 2 units of K410IB4x2 buses – all are financed by Scania Credit. Sentosa Jaya and Yusri Maju also received 2 truck units of G460CA6x4EHZ with Retarder and 1 unit of P410LA6x2MNA with Opticruise respectively on the same day. “Terengganu state presents an exciting growth area to our customers’ operations. Our customers support the oil & gas, tourism and agriculture industry that is booming here. 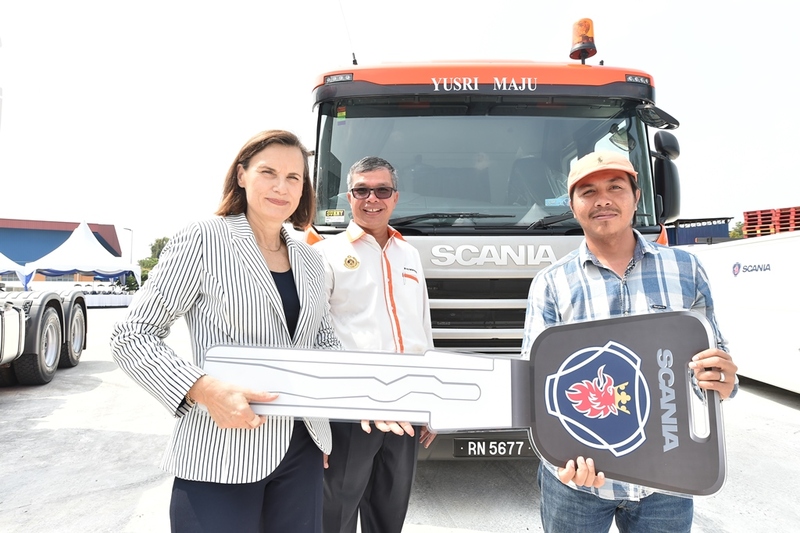 This is why Scania Malaysia continues to improve our network coverage and our products and services in order to support their business which supports the state. Our customers’ uptime is our priority.” added Marie. 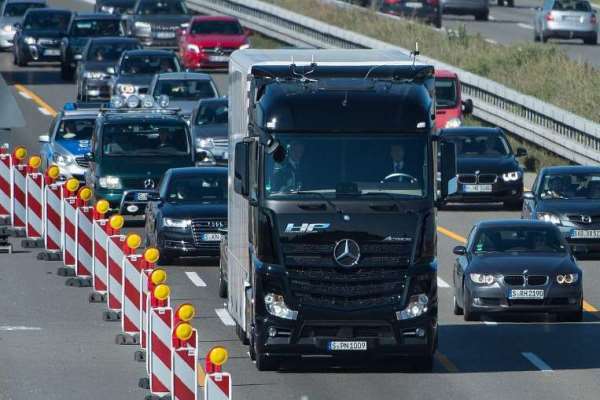 The world’s first truck with automated driving system was finally put to the test under real world scenario recently in Germany. 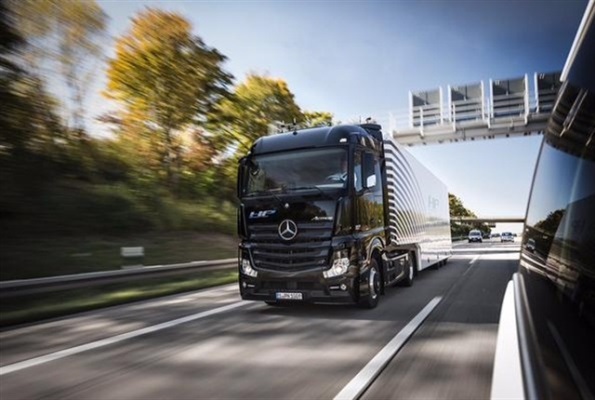 The truck was a standard Mercedes-Benz Actros equipped with the Highway Pilot system for this test of autonomous driving on public roads. According to Daimler, the truck was approved as a test vehicle in accordance with §19/6 StVZO (German road traffic type approval law). “Today’s premiere is a further important step towards the market maturity of autonomously driving trucks – and towards the safe, sustainable road freight transport of the future”, said Daimler Board Member Dr Bernhard. The multi-sensor fusion, i.e. 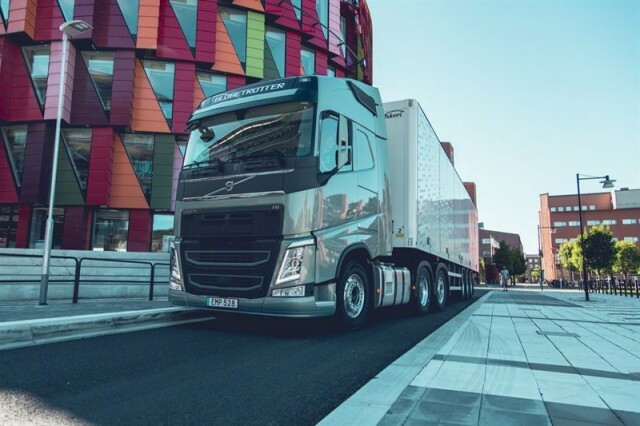 the combination of proven new-generation assistance and safety systems and sensors, enables the truck with the Highway Pilot system to continually observe the entire area in front of the vehicle and to take control itself in certain situations. This gives Dr Wolfgang Bernhard the opportunity to take his hands off the wheel without incurring any risks. How the system works is that it offers to take over vehicle operation once the driver turns on the Highway Pilot system. Once he or she confirms at the press of a button, the Actros meticulously keeps to its lane and maintains the optimum distance to the vehicle in front of it. Should the distance become too small or if a vehicle cuts in front of it, the truck brakes. If it approaches an obstacle such as roadworks, the system asks the driver to take over the vehicle. If the roadworks are behind the truck, the Highway Pilot can once again take over control of the vehicle. Daimler said that the Mercedes-Benz Actros’ safety systems such as the Mercedes PowerShift 3 gearbox, Predictive Powertrain Control (PPC) system, Active Brake Assist 3, proximity control, drowsiness detection and a Fleetboard vehicle computer systems are linked with the sensors of the Highway Pilot technology, which uses a radar and stereo camera. 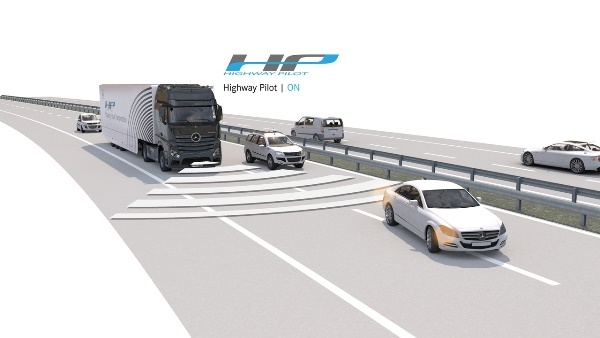 So all the technology of the Actros with Highway Pilot is in the vehicle, and the truck does not need the internet for its automated driving function. The system is ideal for highway as it maintains the correct distance to the vehicle in front and brakes in good time if another vehicle cuts out onto the road in front of it. The Highway Pilot does not replace the driver, but supports and relieves the strain on them by dealing with monotonous stretches for them and taking care of annoying stop-and-go driving in a traffic jam. In automated mode the driver has control over the truck at all times and in tricky situations can take over driving of the vehicle again. The redundancy in the sensor system and fail-safer components such as the steering and brakes ensure an extremely high safety standard. If the minimum prerequisites for the system are not present due to bad weather or missing road markings, the Highway Pilot issues acoustic and visual impulses to ask the driver to take over. The driver has sufficient time to take over the task of driving. If there is no reaction from the driver, the truck brings itself to a standstill independently and safely. Around two thirds of all accidents in road traffic are rear-end collisions and accidents resulting from unintentionally leaving the lane. Often the causes are drowsiness, distraction and driving errors. This is where the Highway Pilot is superior to any human being. It is alert, concentrated and relaxed. Without exception, round the clock, seven days a week. 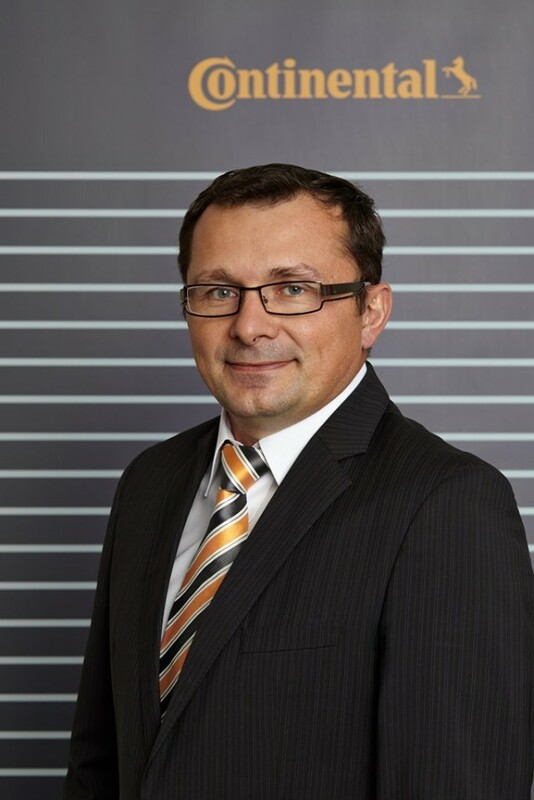 The international tire manufacturer and automotive supplier Continental has appointed Philippe Barabinot as the new Head of Sales & Marketing for their replacement truck tire business in the Asian-Pacific region (APAC). 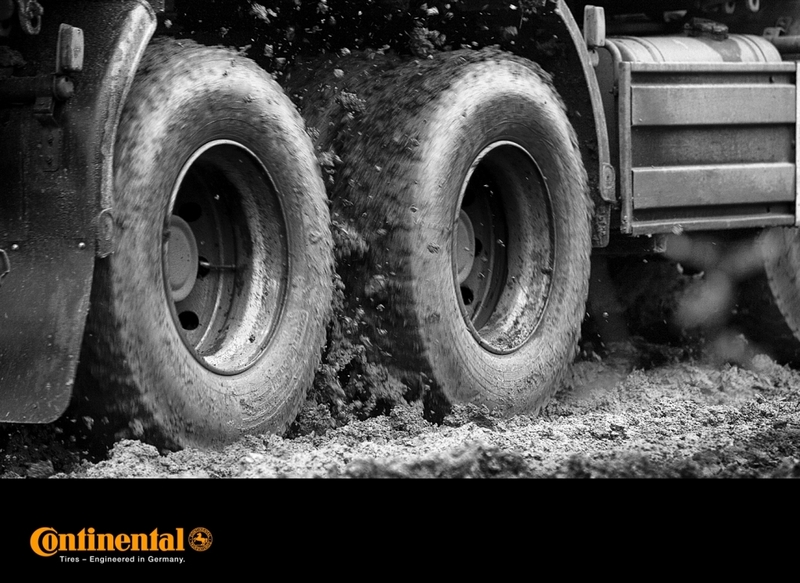 He will be based in Continental’s APAC headquarters for Truck Tires in Petaling Jaya, Kuala Lumpur. Philippe will be responsible for contributing to Continental’s growing efforts in the APAC business region handling the diverse truck tire market that geographically spreads from South Korea to Australia with a keen focus on driving sales and marketing initiatives. He will also oversee the development and expansion of current and new markets in this region. Continental’s truck tire business objective is to deliver the lowest overall driving costs to customers, and Philippe will spearhead this through strengthening Continental’s portfolio via products that are both reliable and agile. 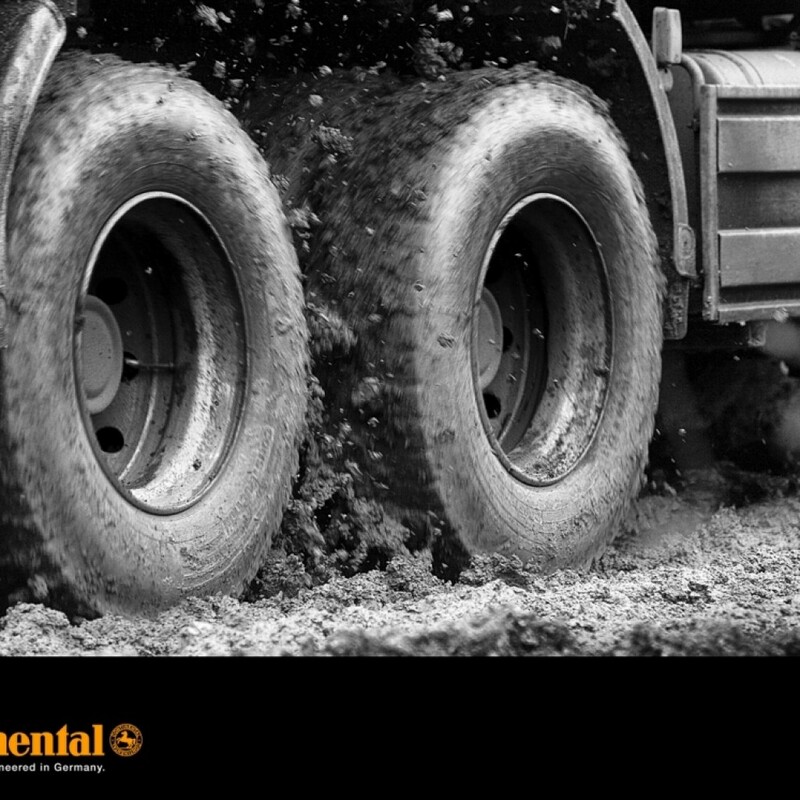 Continental Tires’ promise of “Driving Performance for You” also provides the ongoing commitment of delivering advanced technology-driven products and solutions. Instilled early on with the core values of Continental to trust, have passion to win, have the freedom to act and to act for one another, Philippe Barabinot, an employee since the early 2000s, has worked his way up and brings with him a breadth of international experience in the tire business. He previously served in the specialty tire business of Continental as global Head of Marketing and Key Account Management. 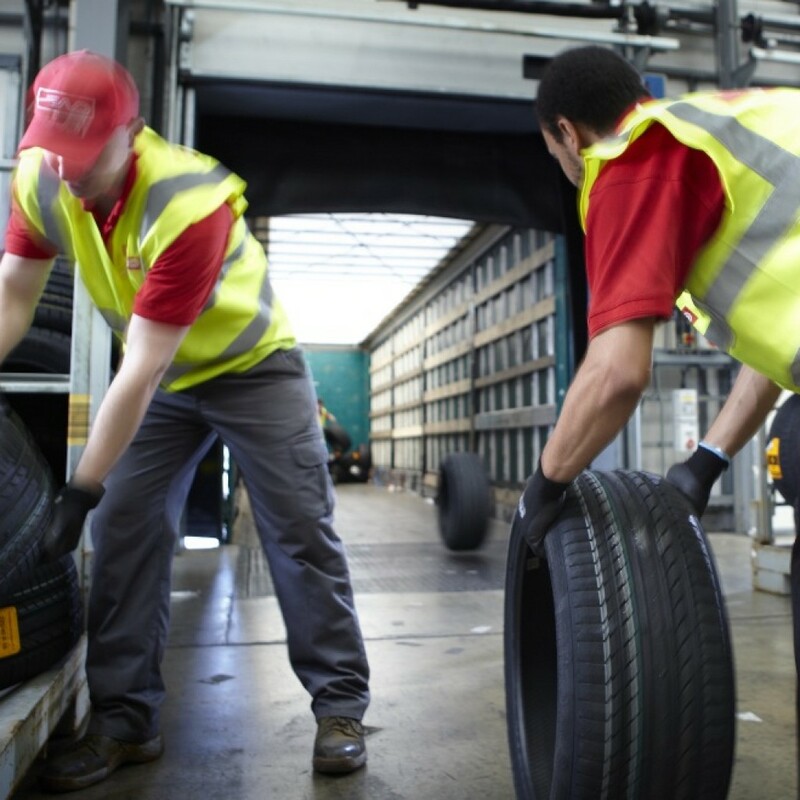 The truck tire business in Asia-Pacific has experienced steady and encouraging growth. 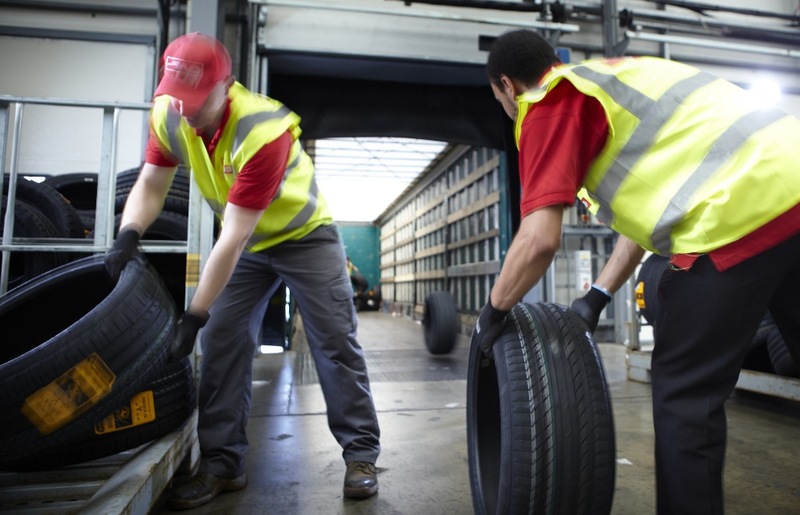 Continental is widening its reach and increasing presence in the region with South Korea being the latest endeavour for its truck tire business. Scania has given the green light to hydrotreated vegetable oil (HVO) being used to power its Euro 6 range, provided the fuel used meets technical specification TS15940. Vehicles using HVO – which chemically mimics fossil-fuel-based diesel – can under optimal condition achieve up to a 90-percent reduction in CO2 emissions. HVO does not affect a vehicle’s characteristics or its maintenance requirements. 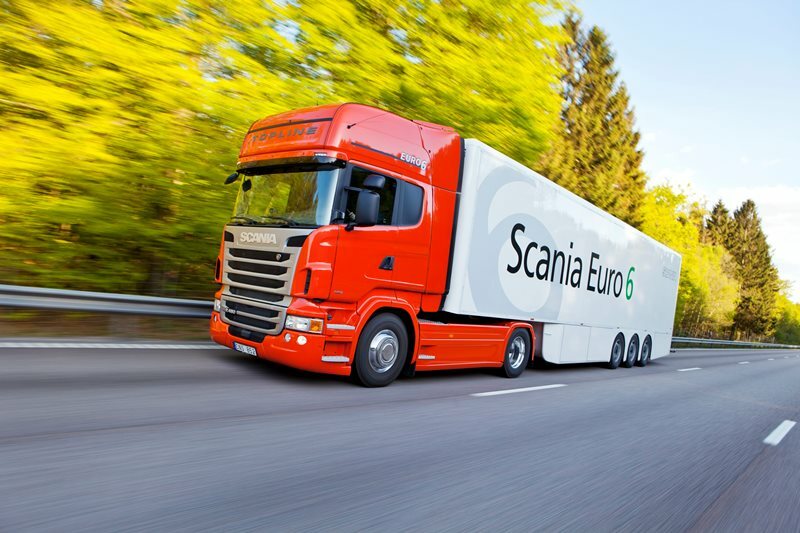 Earlier this year, Scania approved HVO for use in all types of Euro 5 vehicles and all types of operations. In cooperation with customers, the company also initiated a field test in Sweden involving some 100 trucks with Euro 6 engines. HVO is a biofuel that has been much discussed in recent years, and a number of leading manufacturers have incorporated HVO into their ranges. The fuel is based on either vegetable oil or animal fats. Hydrogen gas is used to create hydrocarbon chains that mimic fossil-fuel-based diesel. This means that the fuel can also be distributed and used in the same way as regular diesel, including with regard to its thermal- and storage properties.